Cyclone Andy made everyone stand up and take notice with a devastating victory in the Brian Beattie Handicap at Flemington. While it came as a suprise to many tipsters it certainly wasn't for Pat and the team at Trotter Racing. Going into the race the only concern for the inexperienced son of Yasey was tackling the straight six for the first time and the highly spruiked runners from the Kent and Moroney yards. Cyclone Andy still did alot wrong in running and with the advantage of multiple Melbourne Cup and Group 1 winning jockey Glen Boss having ridden him at his last start he was ready to drive him through when he hit a flat spot and made him really attack the line. In the end Cyclone Andy went to the post ears pricked with the rest of the field 3 lengths away. Post race Boss was glowing in his appraisal of the horse and gave a free tip to all those listening on TVN to remember his name for when he comes back next time in he will make a serious sprinter. The win at Flemington was a first for Pat as a trainer and was even more satisying as Cyclone Andy was bred by the Trotter and Morgan families, raised at Devon Meadows and has been in the Trotter Racing system from day 1. 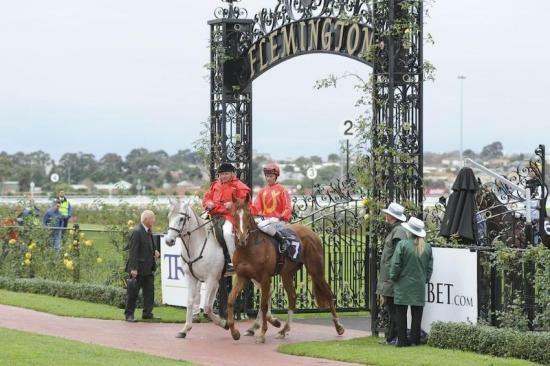 Cyclone Andy has plenty of maturing and improvement still in him and it was great testament to Pat's horsemanship and training to get him into the winners circle at Flemington at his first campaign.